We have just returned from another great horse holiday. We have taken the horses out camping. 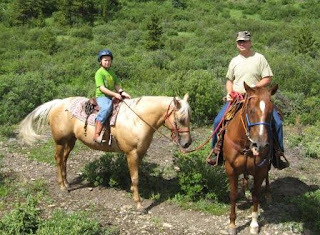 Our family Horse Camp. 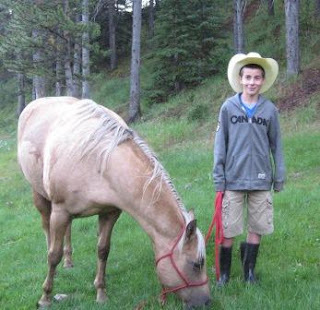 Here is a photo of Wyatt and his Quarter horse mare Honey. She does a great job of taking care of young riders. This is Adam on Honey and my husband Brad on his Scotty. Now I can not lie. This photos are from last years trip. I have not unpacked enough to find the camera. I have miss placed my camera for a full month now and I have used Wyatt's for a few weeks. Now his camera is in my saddle bag still in the horse trailer. We can home one day early as it is pouring rain. Maybe it will be dry enough to unload the tack on Saturday. This year trip was to Horse Creek Ranch and the sand hills. What great trails. Last year we were in the mountains at the Hummingbird creek. I hope to find Wyatt's camera and down load my photos soon. then I will have the correct photos. I wish I could find my camera.